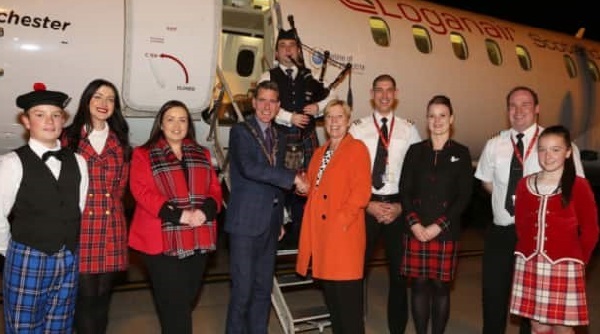 Fresh from filling a gap for Glasgow – Derry flights after Ryanair pulled off the route last weekend, Loganair is planning four new routes from Edinburgh next year, including the first link to Islay in the Hebrides. The first flight of the new five-a-week Glasgow – Derry service took to the sky two days after Ryanair departed. The last time the Scottish carrier landed in Derry was in October 2008. The maiden service was met by the mayor of Derry City and Strabane District Council member John Boyle, with passengers presented with certificates and treated to live entertainment to mark the occasion. Loganair, which set up the first air link between the two points in 1979, is using the 33-seat Saab 340 on Mondays, Thursdays, Fridays and Saturdays, with a larger-capacity 50-seat Saab 2000 on Sundays. The Edinburgh – Islay service starting in March will also use the Saab 340, operating an initial four services a week rising to daily by May, giving passengers from the island global connectivity at Edinburgh via British Airways, Emirates and Qatar Airways. Other Edinburgh developments include the introduction of year-round flights to Stavanger and Bergen and a seasonal link to Guernsey, all to be operated by the 37-seat Embraer 135.